Relaxation is the key to well being. Magnesium helps support and maintain muscle function and winding down at night. True Food Magnesium is easily digested and absorbed, and like all True Food nutrients it is more potent than standard supplements. This product is easily digested and absorbed (without normal laxative effect) and is more potent than regular magnesium supplements. Magnesium is a mineral that functions as a co-enzyme for proper nerve/muscle function, regulation of body temperature, energy metabolism, DNA/RNA synthesis and the formation of bones. The majority of the body’s magnesium is found in the bones. Magnesium is needed as a co-factor for several enzymes to help convert carbohydrates, protein, and fat into energy. Magnesium supplements may play a role in supporting energy metabolism. Due to the role of magnesium in conducting nerve impulses, supplements have been promoted for support of heart function. Magnesium’s role in supporting and maintaining healthy bones stems from its primary location in bone tissue and its ability to help increase calcium absorption. Propietary mixture: magnesium chloride with enzyme digested Saccharomyces cerevisiae (with soya); bulking agent: microcrystalline cellulose; anti-caking agent: magnesium stearate*; anti-caking agent: silicon dioxide; coating: methylcellulose, glycerine, natural vanilla flavour (agave syrup; flavour: vanilla extract; colour: caramel). Adults: Take 2-3 tablets a day, with or between meals, or as your health professional advises. Below are reviews of Higher Nature True Food Magnesium - 30 x 50mg Tablets by bodykind customers. If you have tried this product we'd love to hear what you think so please leave a review. I sleep calm with this product. Question about True Food Magnesium - 90 x 50mg Tablets Are the True Food supplements suitable for those with an intolerance to yeast? Question about True Food Magnesium - 90 x 50mg Tablets Are the nutrients in the True Food range synthetic? Question about True Food Magnesium - 90 x 50mg Tablets What form of magnesium is used in True Food Magnesium? Because of the way the True Food products are made and absorbed in the body the magnesium (and indeed any other mineral) does not have to be attached to a carrier such as citrate, gluconate etc. The body sees the True Food magnesium as food which means there many more opportunities (ie receptor sites) for absorption in the digestive tract than there are for regular mineral supplements. 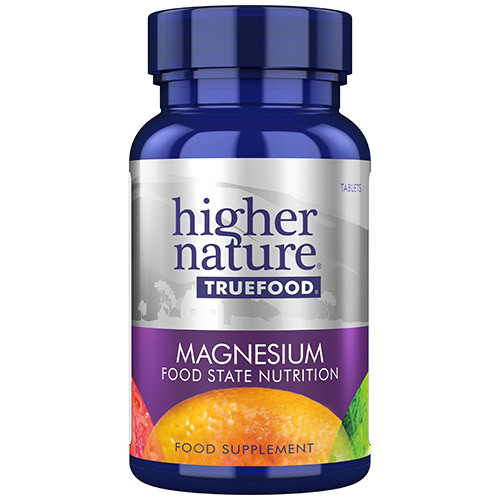 Question about Higher Nature True Food Magnesium - 30 x 50mg Tablets Are the True Food supplements suitable for those with an intolerance to yeast? 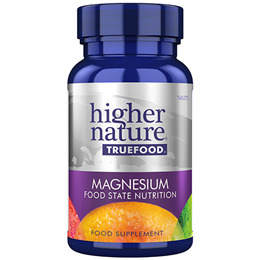 Question about Higher Nature True Food Magnesium - 30 x 50mg Tablets Are the nutrients in the True Food range synthetic? Question about Higher Nature True Food Magnesium - 30 x 50mg Tablets What form of magnesium is used in True Food Magnesium?